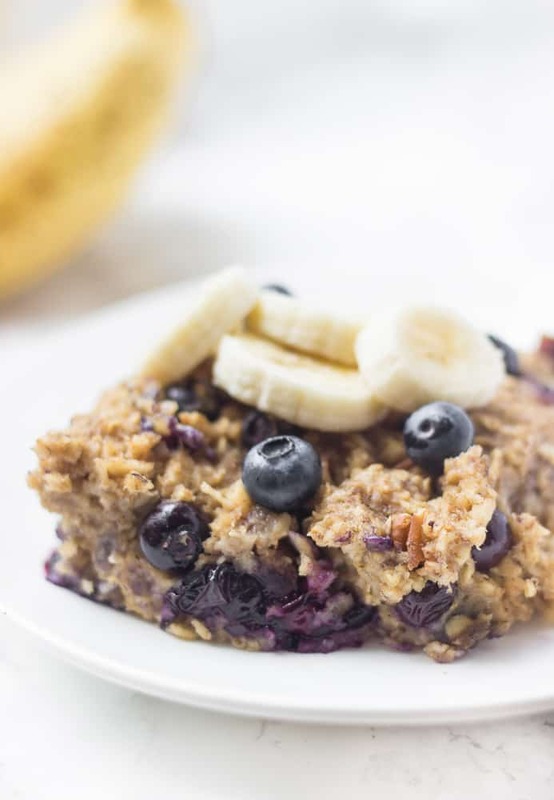 This banana blueberry baked oatmeal is a healthy make-ahead breakfast to enjoy all week long! The first day of class is less than a week away! I’ve been back at UNC for nearly three weeks, and the first two weeks of that were training for my on-campus job, which meant long days…like 9am-8pm. 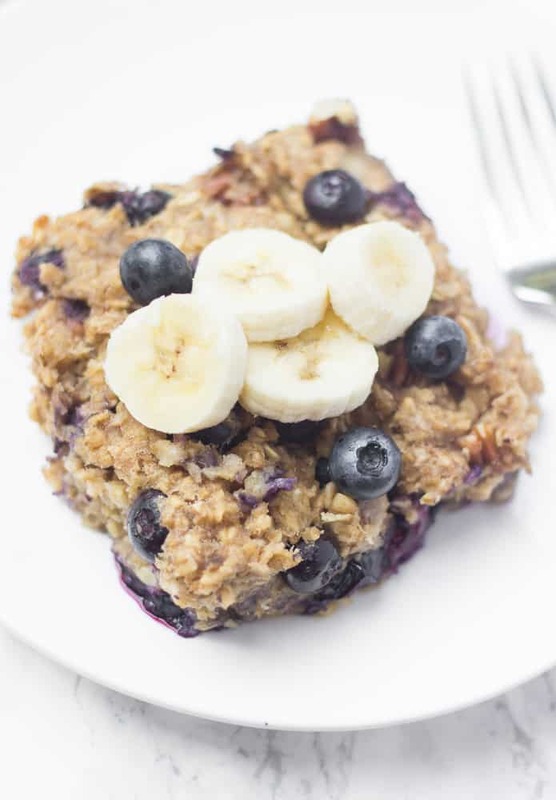 But if I make something like this banana blueberry baked oatmeal, it feels really productive, too, because my breakfasts for the rest of the week are all done! Baked oatmeal is definitely a cozy food for cooler weather, but I’ll happily eat it all year-round. And if I make it in the summertime, I can use all of the fresh berries that are available (although frozen would work well, too!) 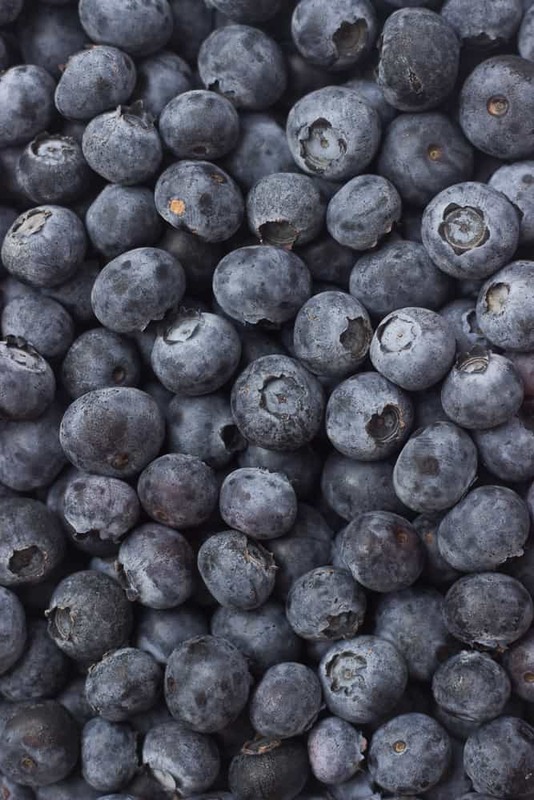 I’ve been on such a berry kick lately, though, and whenever I buy a quart of blueberries, it’s gone in about two days. Soooo good. 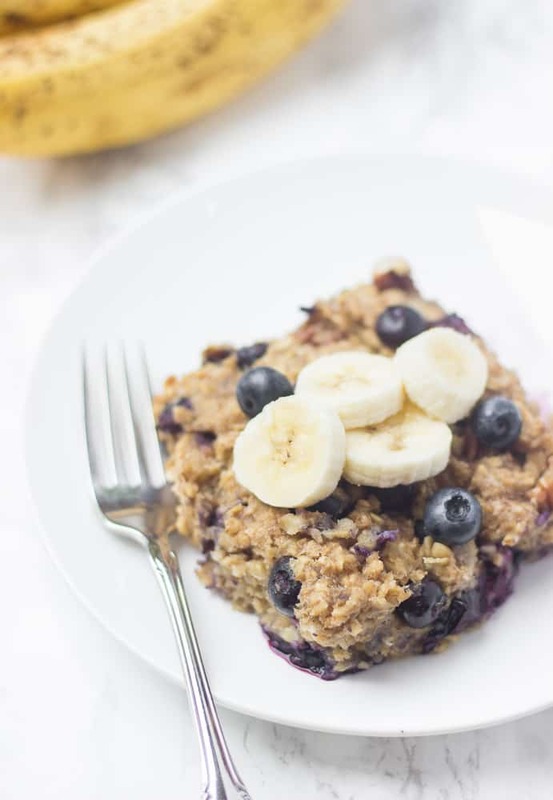 I always try to test each recipe at least twice before I post it on the blog, just to make sure it’s foolproof and to see if there are any ways to improve it, so the first time I made this banana blueberry baked oatmeal was when I was at home this summer. My mom tried it and said it’s almost like a blueberry muffin, and I completely agree! But I think it’s better than a muffin because it’s hearty, filling, and one serving is pretty large. I’d take this over a tiny lil’ muffin any day! I’ll add scrambled eggs for a bigger, protein-packed breakfast or enjoy it by itself on days I’m not quite as hungry. I just made a new batch yesterday and I can’t wait to enjoy it all week long as an easy, healthy dorm breakfast. 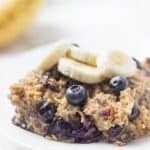 If you try this banana blueberry baked oatmeal, feel free to let me know in a comment or take a picture and tag me @livbane on Instagram. Hope you enjoy! Grease an 8x8 or 9x9 baking dish with butter or cooking spray. 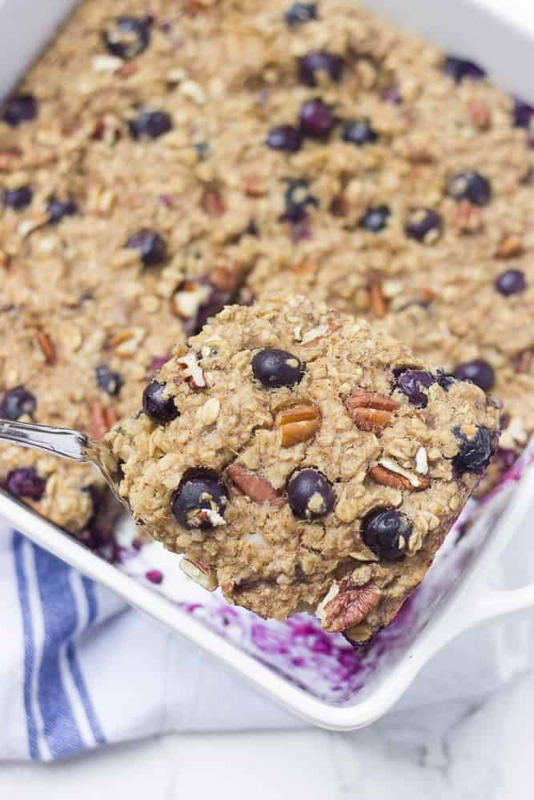 Pour oat mixture into pan and bake for 28-33 minutes or until the baked oatmeal is set and a toothpick inserted in the center comes out mostly clean. Let cool for 10 minutes in pan and serve, or refrigerate in a storage container for up to 5 days, reheating in microwave before serving. To double the recipe, bake in a 13x9 inch dish for 38-42 minutes at 375 degrees and cover with foil during last 15 minutes of baking to prevent over-browning. Definitely! I love making one or two things in advance to have for the week! This looks like a great healthy breakfast to prep ahead for the week. Thank you for sharing! Yes! It’s such a quick thing to throw together and have around for the week! I’ve actually never tried baked oatmeal. This looks absolutely amazing! I’ve never tried baked oatmeal. But it seems like the perf breakfast!! If you give it a try, you’ll have to let me know what you think! Almost sounds like a cookie. We will have to try it. I think the texture is more like a muffin then a cookie (just so you’re not surprised) but you’ll have to let me know what you think when you give it a try! I have tried this recipe and it is delicious! It is hard to eat just one piece! I’m so glad you enjoyed this baked oatmeal!! Yummm! Love baked oatmeal! It’s so nice having a slice to pull out of the fridge when you’re half-awake and hungry in the morning, haha. I agree! I’m going to make another batch tonight! What did you bake this in – what size pan? Hi Erin! I baked this in a 9 x 9 inch pan, although an 8×8 would also work. I’ll update the recipes to reflect that. You can add the bananas with the liquid ingredients! I made this recipe again today and used frozen blueberries instead of fresh ones. It was still incredibly delicious, but I had to bake it for longer than the suggested time for it to set in the middle. I don’t think I could ever get tired of eating this! Thanks for reporting back and for noting that it takes longer to cook when using frozen berries!! I’m so glad you love the recipe!